The Dietrich Bonhoeffer Portal was opened in November 2014 as a partnership between the German Section of the International Bonhoeffer Society and Gütersloher Verlagshaus. The German speaking section (ibg or Internationale Bonhoeffer-Gesellschaft Deutschsprachige Sektion e.V. 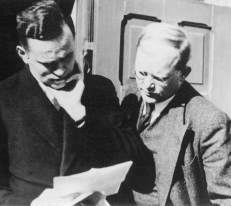 ), promotes studies on the life and work of Dietrich Bonhoeffer and publishes newsletters three times a year. The ibg has close relationships with the International Bonhoeffer Society-English Language Section, as well as sections in the Netherlands, Poland, Japan, Korea and Brazil. It actively participates in the formation and presentation of quadrennial international congresses. It also has links to the Bonhoeffer Archives (comprised of primary and secondary texts) located at Union Theological Seminary in New York as well as the Bonhoeffer estate in the Berlin State Library. The searchable bibliographic database of nearly 6,000 titles brings a large selection of non-English works to the attention of English speaking students and scholars.